The long-anticipated exhibition “Thracian Kings’ Epic. Archaeological Discoveries in Bulgaria" (also translated as “The Saga of the Thracian Kings"; in French: L’Épopée des rois thraces. Découvertes archéologiques en Bulgarie), dedicated to Ancient Thrace has been formally inaugurated in the Louvre Museum in the French capital Paris by officials from Bulgaria and France. The exhibition (whose original working title was “Ancient Thrace. The Odrysian Kingdom") showcases the most impressive treasures of Ancient Thrace, and the way of life of the little known internationally Odrysian Kingdom, the most powerful state of the Ancient Thracians, and some of the independent Thracian tribes such as the Getae (Gets) and the Tribali. 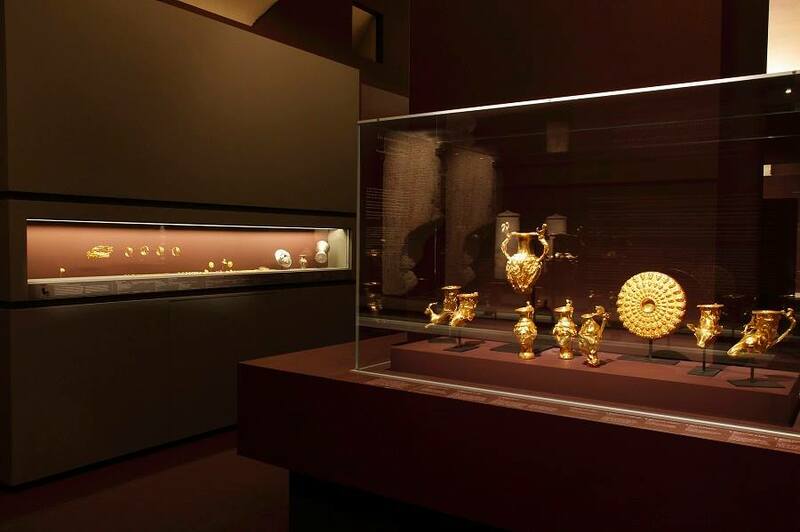 A total of 1,629 Ancient Thracian artifacts from 17 Bulgarian and 11 foreign museums have been exhibited in four halls in the Richelieu Wing of the Louvre from April 14 until July 20, 2015. The exhibition “Thracian Kings’ Epic. Archaeological Discoveries in Bulgaria" has been opened by Bulgaria’s Prime Minister Boyko Borisov, Bulgarian Culture Minister Vezhdi Rashidov and his French counterpart Fleur Pellerin as well as UNESCO Director-General, Bulgarian Irina Bokova, Bulgaria’s EU Commissioner Kristalina Georgieva, and French-Bulgarian singer and actress Sylvie Vartan. “We have the confidence of stating that for the first time the Louvre is opening its doors to a foreign exhibit. This shows respect for Bulgaria and its culture," Borisov has stated at the opening of the exhibition, as cited by BTA. As part of his visit in Paris for the opening of the Ancient Thrace exhibit, he has met with French President Francois Hollande, French Prime Minister Manuel Valls, and former French President and UMP leader Nicolas Sarkozy. “Entering this museum we have already entered the history of world culture. We, too, are a globally significant nation in the field of culture. From now on, we must remember that Bulgaria, too, is a factor in culture. We must be proud, instead of imitating foreign models, because we are equal among equals," Bulgaria’s Culture Minister Vezhdi Rashidov has stated. Borisov and Rashidov have announced that museums in Croatia, Morocco, Romania, Russia, and the UK have already asked to host the Ancient Thracian exhibit. The artifacts from Ancient Thrace were shipped from Bulgaria to France by plane under utmost security measures on March 23, 2015. The Odrysian Kingdom, a union of Thracian tribes dominated by the tribe of the Odrysians (also known as Odrysea or Odrusai), was the most powerful state of the Ancient Thracians. It existed from the 5th century BC till its conquest by the Romans in 46 AD on the territory of modern-day Bulgaria, Northern Greece, Southeastern Romania, and Northwestern Turkey. The treasures displayed in the Louvre include the Panagyurishte Gold Treasure, the Rogozen Treasure (gold and silver), the Borovo Silver Treasure, the Letnitsa Treasure (silver and bronze), the Mogilanska Mound Treasure (also known as the Vratsa Gold Treasure), the Zlatinitsa Mound Treasure (gold and silver), and the bronze head of Seuthes III, king of the Odrysian Thracian Kingdom between ca. 331 BC to ca. 300 BC. They have been insured for a total of EUR 165 million for the duration of the exhibition in the Louvre where they will be seen by about 4 million people, according to estimates by French experts. The bronze head of Odrysian King Seuthes III has been insured for EUR 13 million while the most precious threasure in the exhibit, the Panaguyrishte Gold Treasure, has been insured for EUR 50 million. The catalog for the exhibition “Thracian Kings’ Epic. Archaeological Discoveries in Bulgaria" has 320 pages and contains 250 photos, and articles by Bulgarian and international scholars. The preparation for Bulgaria’s Thracian exhibition in the Louvre started back in 2012 after then and current Bulgarian Minister of Culture Vezhdi Rashidov signed a five-year cooperation agreement with the Louvre. Dr. Néguine Mathieux, division head in the Scientific Research and Collections Directorate of the Louvre. Kazanlak Museum of History “Iskra"
The Ancient Thrace exhibition in Paris also features a number of Ancient Thrace-related items from 11 foreign museums – including 20 items from the Louvre, as well as items from the British Museum in London, the Ny Carlsberg Glyptotek in Copenhagen, the Prado Museum in Madrid, the Naples National Archaeological Museum, and the Bari Archaeological Museum, among others. Seuthes III was a king of the Odrysian kingdom of Thrace from ca. 331 BC to ca. 300 BC, at first tributary to Alexander the Great of Macedon. In 2004, as part an expedition dubbed TEMP, late Bulgarian archaeologist Georgi Kitov discovered Seuthes III’s tomb on the Golyama Kosmatka Mound near his capital Seuthopolis (close to today’s towns of Kazanlak and Shipka), part of the Valley of Thracian Kings. The impressive finds included the famous lifelike bronze head of Seuthes III, his golden laurel wreath, golden kylix (ancient drinking cup), among others. The Rogozen Treasure was discovered by chance in 1985 by a tractor driver digging a well in his garden in the Bulgarian village of Rogozen. It consists of 165 receptacles, including 108 phiales, 55 jugs and 3 goblets. The objects are silver with golden gilt on some of them with total weight of more than 20 kg. The treasure is an invaluable source of information for the life of the Thracians due to the variety of motifs in the richly decorated objects. It is dated back to the 5th-4th centuries BC. The Borovo Treasure, also known as the Borovo Silver Treasure, consists of five silver-gilt decorated vessels found in 1974 while ploughing a field in Borovo, Northeastern Bulgaria. The set has a bowl, a rhyta jug, and three rhyta, the largest of them with a figure of a sphynx and an inscription reading: “[Belongs to] Cotys from [the town of] Beos. ", as well as the name of the craftsman, Etbeos, leading to speculations that the treasure may have been a gift to a local Getic ruler from Odrysian King Cotys I (r. 382-359 BC). The Letnitsa Treasure is dated back to the 4th century BC. It was found by accident in 1963 during a dig near the town of Letnitsa in Central Bulgaria in a bronze vessel. It consists of a large number of small decorated silver items as well as a Thracian warrior’s decorated horse ammunition found nearby.